Let’s face it: sports are more fun to watch than to read about. 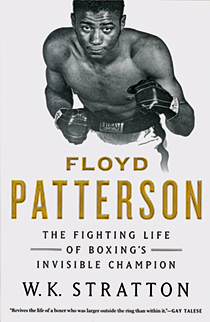 It’s hard to appreciate the whoosh and boom of Floyd Patterson’s left hook on the page. So we read to understand the man and his time, and this we cannot glimpse on YouTube. Patterson became the youngest heavyweight champion of all time at the age of 21 in 1956 after clawing his way out of a New York ghetto and a troubled youth. Outside the ring, he became Muhammad Ali’s counterpoint in black American culture. Ali called him an “Uncle Tom”; Patterson refused to stop calling his opponent Cassius Clay, long after Ali became a Muslim and changed his name. He also looked at the exclusionary rhetoric of the Nation of Islam and said Ali “might just as well have joined the Ku Klux Klan.” Patterson refused to fight in segregated arenas and visited Birmingham at Martin Luther King Jr.’s side. He was a devout Catholic and unrepentant supporter of the Vietnam war. In the ring, Ali taunted Patterson, “Come on, white America.” Ali won both their bouts. Patterson may be the most humane man to ever make a living smashing other people’s skulls. Early in his career, when he knocked out an opponent’s mouthguard after a devastating punch, Patterson stopped his onslaught and fumbled around the ring trying to pick up the slimy piece of equipment with his gloved hands. As a teenager at the Helsinki Olympics in 1952, where he won gold, Patterson smuggled food from a seemingly gluttonous athletes’ village to the poor and homeless. He became the iconic gentleman in a corrupt sport. The book doesn’t manage to get beyond some of Patterson’s inscrutabilities. At bouts Patterson feared he would lose, he prepared a fake beard and decoy car to disguise an escape. He preferred training to raising his children. He stuck with a corrupt manager far too long. And, no, he didn’t know how to quit, but the crowds never stopped showing up.